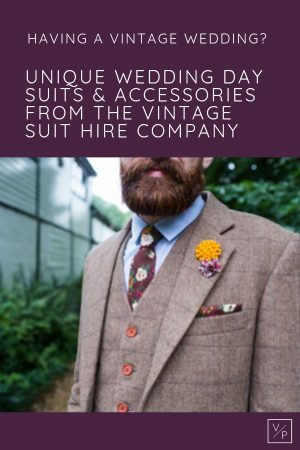 We have filmed many weddings where we instantly recognise the unique wedding day suits designed by The Vintage Suit Hire Company worn by the groom and his groomsmen. We love their innovation and creativity so wanted to get to know them better! 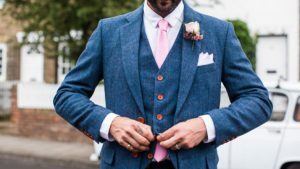 The team have loads of great advice and wedding suit inspiration so if you’re looking for a unique wedding day suit with a stand-out style then look no further! 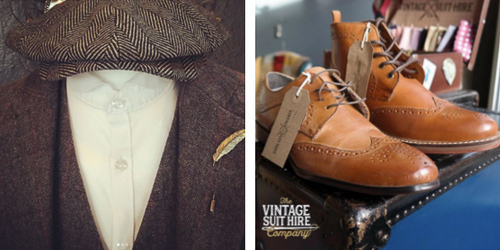 The Vintage Suit Hire Company was founded in 2016 by Jess and Tom Answer and born from personal experiences when they got married in 2011, and struggled to find vintage style (and affordable) suits to hire for Tom and his groomsmen. 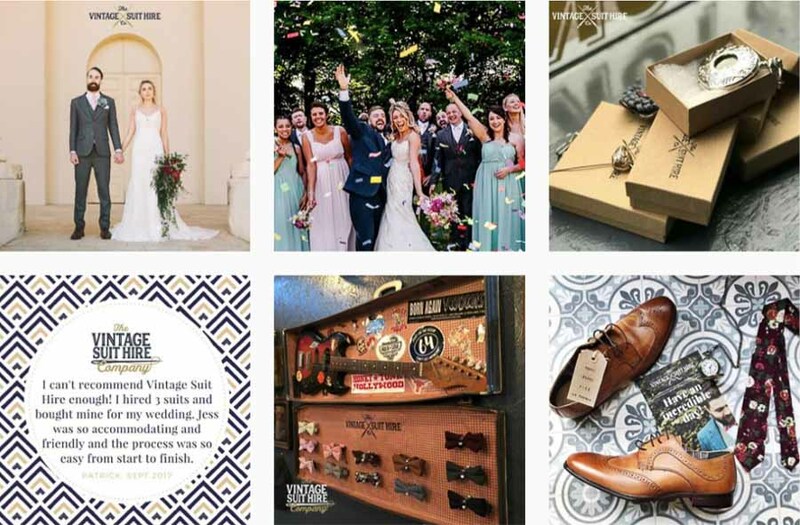 350 weddings later they have gone from strength to strength and built a loyal and treasured client base, celebrated their one year shop anniversary and expanded the team to ensure customers have the best experience possible in choosing their vintage inspired suit for the big day. There’s loads of inspiration for brides choosing their wedding dress but less so for the groom’s outfit. For guys who have just got engaged, where would you advise they get ideas from for their outfits? Ordinarily the groom’s outfit is led by the overall theme and colour scheme of the wedding, the season in which the big day occurs and their unique personal style. Our Instagram page is a great place to start to get outfit inspiration from as we think it makes the challenge of picking the perfect suit seem less daunting once you see how other grooms have styled theirs! With the range of accessories and variety of different styling options – we are able to create a full vintage style look, or just a subtle nod towards an era, depending on the groom’s preference. If couples are looking for traditional styles what would you recommend? We are pleased to offer three distinctive suits that all have a traditional look but each have their own individual flair. Our best seller and most popular hire is the Southwold suit. It works well in every season and colour scheme and compliments a stately home, rustic barn or coastal wedding venue. It’s a striking three- piece wool suit with contrasting brown buttons, and can be dressed up with our range of ties or left with an open collar and pocket watch for a more relaxed but distinguished look. For a fashion savvy groom, what styles do you think will be popular in 2018? With the popularity of shows such as Peaky Blinders we feel men’s fashion from the 1920’s and 1930’s is being revisited and reworked for the modern man. We forecast 2018 will see an increase in this era of styling. A bold suit such as the Harrogate brings this expression into the forefront of grooms styling. Paired down with a penny collar shirt and pocket watch will make an impact on the big day with a gentle nod to yester year. What would you recommend for couples wanting a less formal look on their wedding day? Our prediction for 2018 styling is also a great way to achieve a more relaxed look for the groom. We recommend the simple yet significant styling of a three-piece suit, penny collar shirt and brogues. What is the process for choosing and fitting a suit with you? We try to make the process as simple and painless as can be. Our clients can book initial consultations, individual and group fitting appointments online. They can come to our shop in the independent quarter of Bedford town centre to try on all three styles of suit. If they have one in mind already, they can lead the way and get the right size and pick accessories. Of course, we’re happy to help and guide the styling of the suit and accessories as well. At the initial consultation, we love to hear all about wedding plans for the big day. Once we gain a better understanding of the look you are trying to create, we can get the suit looking just right with the venue and décor. Once you’re in your suit, you can snap a few photos to mull over later. If you’re opting for our made to measure service, we’ll take our full set of measurements. Additionally, if you’re happy, we take a deposit to confirm the wedding date in our diary for a hire booking. To buy suits, we can take payment to get a suit on order straight away. Alternatively, we can arrange to get another date in the diary 3 months prior to the wedding date to revisit sizing. Do you have accessories as well as suits for couples to choose from? We do indeed! A range of accessories for the groom and groomsmen are in stock and you can now buy online. We have an assortment of ties and bowties including knitted, cotton and wool, with pocket squares to match. In addition, we also provide brogues, boots, braces, hats, lapel pins and pocket watches. These can also be engraved to add a personal touch and make a great gift to your groomsmen. What’s the best way for couples to contact you about their wedding? We love to hear from couples who are planning to hire or buy our suits for their special day, they can contact us via our website Vintage Suit Hire Co and don’t forget to follow us on Instagram and like us on Facebook too!